Calisphere: Aires for the harpsichord. UCLA, William Andrews Clark Memorial Library > Early Modern English Manuscripts from UCLA’s Clark Library > Aires for the harpsichord. Text set / Aires for the harpsichord. RE: Calisphere: Request high-resolution copy of item for Aires for the harpsichord. Do you need a bigger file? The file available on this site is 1024 x 754 px. To obtain an alternate file type or higher resolution copy, please contact the owning institution. Finney, Theodore M. (Theodore Mitchell), 1902-1978, former owner. Scope/Content: Manuscript. Title written in fading ink on front cover. 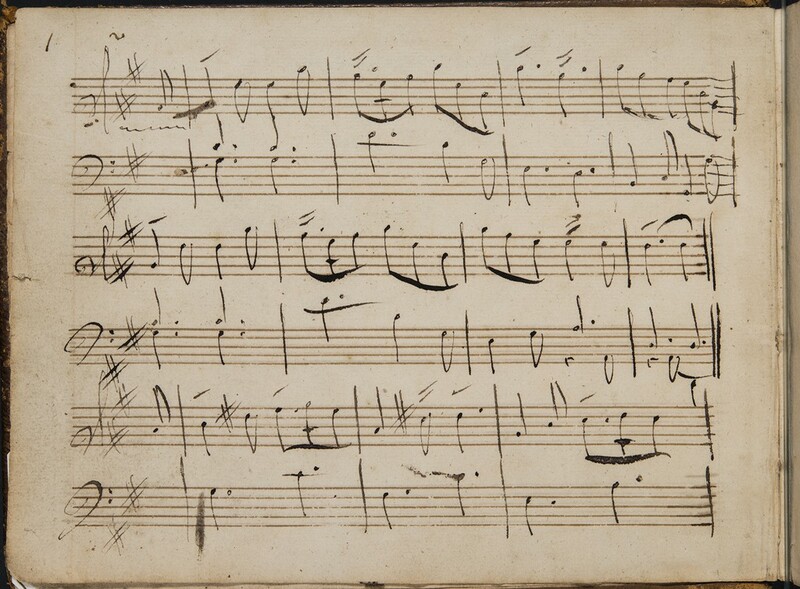 Scope/Content: Music manuscript containing pieces for the harpsichord. No composers are identified except for Archangelo Corelli and his Op. 5, no. 7. Condition: Bound in old calf; front cover and initial pages detached from rest of volume; housed in modern cloth case. 22,  p., bound15.5 x 20 cm. Harpsichord music--Early works to 1800. Bookplate of Theodore M. Finney's "Private Music Library" on front paste-down endpaper (Finney manuscript 16); 18th century pen trials and the names Elizabeth and Howard on front free endpaper; 18th century notes about tuning "ye spinnet" on front free endpaper; "begun F ---- S 28th 1725" in a different hand on back paste-down endpaper.